This post will provide you how to make a two-way system for encrypt form data and decrypt that an encrypted string in PHP using Ajax JQuery. We have already seen many post in which we have store form data in Mysql table in simple original string format. But here we have discuss some security for store Form data using PHP. Here we will not insert form data in it's orignal form. But we will encryt form data using PHP code and then after we will store into Mysql table. So when user save form data then after we will encrypt form data and then after we will insert into Mysql table by using PHP script with Ajax Jquery. Here we will discuss two way encryption and decryption of Encrypted string. That means once we will store form data in encrypted form and then after we want to display that encrypted string on their original format. So at that time we will decrypt that encrypted string by using PHP script and display on web page. So, it is called two way encrypt and decrpt string using PHP script. For encryption and decryption string in PHP we have use different PHP encrypt method like AES-256-CBC. We have use this PHP encrypt method for encrypt string. We have also use PHP hash() function for make encrypted string. We have also use different PHP function like openssl_encrypt() function for convert string to encrypted form and after this we have use base64_encode(). By using this both function we can encrypt string. For decrypt string we have use base64_decode() function and openssl_decrypt() function for decrypt encryted string. This way we can make two way encryption and decryption in PHP. For Two way encryption and decryption in PHP depends on encryption key and initialization vector. If we have lost this two key then we cannot decrypt encrypted string. So string encryption is depends on this two keys and it it is lost then we cannot convert encrypted string. For discuss this things we have use simple Insert Update Delete and Select data example by using PHP script with Ajax Jquery. In this example first we will fetch encrypted data from Mysql table and convert into normal string and display on web page in Jquery Datatables. After this we will Insert form data into Mysql table. So for this we will encrypt form data and insert into Mysql table. 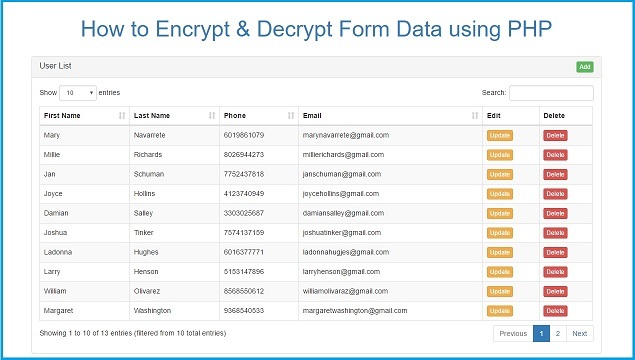 Then after we want to update, so update first we want to fetch single user encrypted data and decrypt and display in form field. For this all crud operation we have use PHP Script with Ajax Jquery. YOUR THE AMAZING SIR !!! Very nice and advance tutorials JUST LOVE IT!! !